Every year, tens of thousands of kittens – whether they be fostered, adopted, found or purchased – are welcomed into their new forever homes. And the pet parents who welcome them owe it themselves and their fluffy bundle of joy to help kittens become socialized by giving them positive experiences and teaching them how to handle those experiences. Done properly, a socialized kitten will likely be more outgoing and social and will be able to better deal with the regular stresses of life. As well, proper socialization can result in a stronger bond between a kitty and his family. 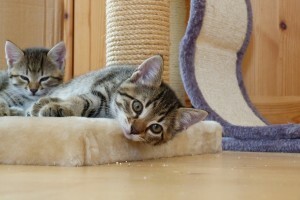 The prime socialization period for kittens is between 8 and 12 weeks of age. Exposure to a variety of things, such as new people and animals, unfamiliar environments, and different sights and sounds, will result in a more well-balanced cat with better coping skills, resulting in less incidents of inappropriate behavior and fewer displays of anxiety and fear. Introduce your kitten to new people, places, objects, and situations only when you can control the experience. Do not introduce your kitten to other kittens or cats until he has been properly vaccinated. Do not allow your cat to sniff feces of or play with any other cats or kittens that may be unhealthy or aggressive. Use praise, touch, play, and treats to reward and reinforce your kitten’s positive behaviors. Socialize your kitten with children, but only under direct supervision. It is very important to get your kitten accustom to being handled. Gently play with / massage your kitten’s ears, mouth, muzzle, paws, tail, etc. This will help acclimate your kitten to nail trimmings, vet visits, introduction to new people, and grooming in the future. Do this regularly (several times per week), and, again, praise your kitten to reward and reinforce positive behavior. Training your kitten is a significant factor in preventing unwanted behavioral concerns. Teaching your kitten to act appropriately in all situations will ensure safe and enjoyable times for you, your family, your acquaintances, and your kitten! Begin training at a young age, preferably at the 8-week old mark. If you have multiple cats, make sure to have at least one litter box per cat in your household, ensuring your kitten has his own and that he knows where it is located. Keep the box in the same place to avoid any unnecessary confusion. Offer your kitten interactive toys, scratching posts, kitty condos, and other appropriate outlets for them to utilize their energy in an acceptable manner. Unfortunately, behavior problems remain the number one reason why pets are relinquished to animal shelters. Let’s help put an end to this cycle by properly socializing our pets, helping them to better tolerate changes in their environment, and help prevent some common behavioral problems in the future.